QUOE is the maker fashion brand by Quayln, renaissance crafter and fiber fanatic. As a child, Quayln was constantly involved in an assortment of crafts. Fabric, glue sticks, and sketchbooks were mainstays in his household. Over the years, Quayln has grown his craft to include hand sewing, machine sewing, drop spinning, beadwork, digital/traditional design, knitting, and most notably, crochet. ​In his short career as a crochet and knitwear designer, Quayln has already begun to establish himself as a strong up-and-comer. 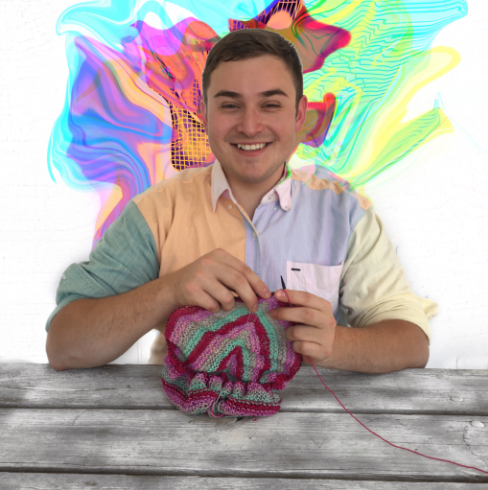 At nineteen years old, he became one of the youngest crochet pattern designer to work in tandem with Red Heart Yarns, and has had much success writing and designing for them and many indie yarn companies around the USA. The mission statement of QUOE has always been “BREAK THE STATUS”, as Quayln is ever evolving in his craft and expanding the definition of what it means to be a crafter in the social age. QUOE embraces everyone who is not scared to step outside the established parameters of crafting.